The Senate’s Committee on Commerce, Science, and Transportation convened an informational hearing on Feb. 6 to explore the benefits, needs, and challenges of 5G technology – especially how its deployment may impact the 5.9 GHz transmission band, currently reserved for transportation communication needs. “The fifth generation of high-speed wireless networks, commonly known as 5G, is expected to increase data speeds up to 100 times faster than today’s mobile technology. 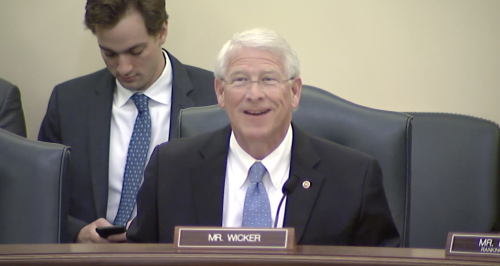 This improvement will not only make our phones and internet-connected products run faster, but also revolutionize the way information is shared between people, businesses, and devices,” explained Sen. Roger Wicker, R-Miss., (seen above) the committee’s chairman, in a Feb. 4 statement ahead of the hearing. “In the United States, 5G networks are projected to result in the creation of more than 3 million new jobs, generate as much as $275 billion in new investments from the wireless industry, and add up to $500 billion to the U.S. economy over the next decade,” he added. He said, according to the National Highway Traffic Safety Administration, V2I technology can help drivers more safely negotiate intersections and possibly prevent 41 to 55 percent of intersection crashes. Another connected vehicle safety application that helps drivers with left turns at intersections could help prevent 36 to 62 percent of left-turn crashes, NHTSA data indicates. Yet Bhatt stressed that to turn such benefits into reality the 5.9 GHz spectrum via which V2X technology communicates data needs protection against “any unlicensed use” within that band – arguments echoed by the American Association of State Highway and Transportation Officials and other groups that oppose an ongoing effort by the Federal Communications Commission to do just that. ITS America’s Bhatt reiterated that point during the Feb. 6 hearing. “The new world of connected vehicles is creating a massive amount of data that must be exchanged at low latencies,” he stressed.